Remember back in June, when Niantic took the stage at WWDC to show off a beta build of Pokémon GO? The one that used Apple’s new augmented reality framework, ARKit, to beef up the game’s AR abilities? Pokémon GO has let you use your phone’s camera to overlay Pokémon onto a view of the real world since launch, but the execution has always been a bit simple. As the only sensor it really cared about was the phone’s gyroscope, Pokémon just sort of floated about in the space in front of you. You could turn left/right to aim, but if you tried moving closer or further away, the Pokémon would just glide around with you. 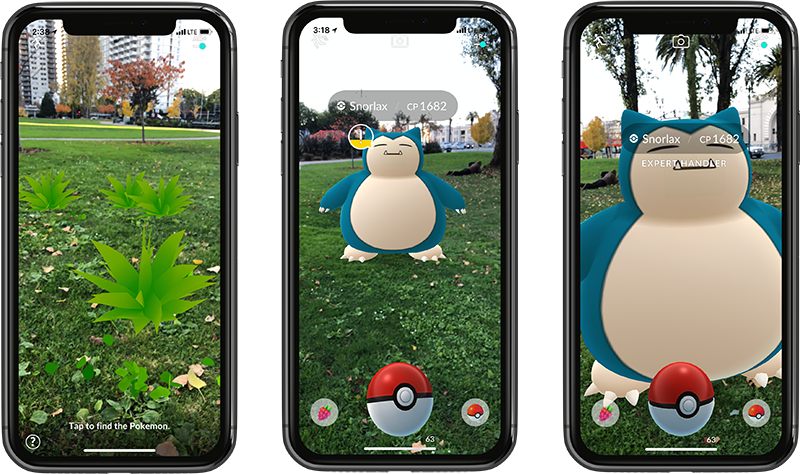 It was a clever enough trick to help rocket the game to its once crazy levels of popularity – but after the novelty of seeing Snorlax in your backyard faded, even the most dedicated players switched AR mode off. Toggling into the camera-free non-AR mode made the battery-thirsty game chug a bit less juice – and as you no longer had to worry about the gyroscope while aiming, turning AR off actually made the game a bit easier. The process of finding Pokémon hasn’t changed: walk around the real world, look for Pokémon that pop up on the map, and tap them to start the encounter. When you encounter a Pokémon in AR+ mode, you’re shown a prompt reminding you to be aware of your surroundings. This game has a lot of safety prompts. Once the game detects a flat surface, you’ll see a few patches of tall grass in front of you (a nod to the handheld Pokémon games.) Tap the grass and the Pokémon pops out. But don’t move too fast! Pokémon have a little icon indicating how freaked out they are; move too close too fast, and they run. Get close enough to a Pokémon without spooking it and “Expert Handler” mode kicks in. This gives you a slight boost in your catch rate – and if you’re successful, you’ll get a bit more XP and Stardust out of your catch. It’s pretty fun to play in AR+ mode – and yeah, it feels totally goofy to be staring at your phone while tip-toeing toward a Pokémon juuuuust slowly enough to not scare it off. But when some rare ‘mon shows its face for the first time in weeks, that little catch rate increase might make it all worth it. Rolling out a noteable new feature to users on just one platform is a risky choice – particularly when said feature brings things like improved catch rates and extra XP. Hopefully Niantic is working on figuring out how to bring this to Android, asap. And for the PoGo players out there looking to fill one more slot in their Pokedex: Niantic confirmed to me that Delibird (the Santa-esque Pokémon that’s been curiously absent since its Gen II companions rolled out) will show up in time for the holidays. That’s been the rumor since just about the day after Gen II first hit back in February, of course – but hey, now it’s confirmed.